Check out the trailer for Deadly Revisions below. 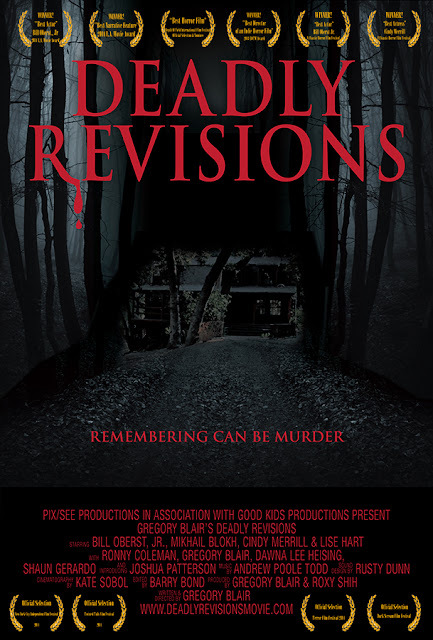 Director Gregory Blair’s Deadly Revisions is getting set to release, through SGL Entertainment. The film will be available on Sept. 29th, on DVD, Blu-ray and Video-on-demand. This indie horror film has appeared in dozens of film festivals, including the Fantastic Horror Film Festival. As well, the film has garnered several awards. The film has even won “Best Director in Indie Horror,” at the EOTM. Also, the film has a recognizable cast, with indie horror vet Bill Oberst Jr. centrally starring, along with Cindy Merrill, Mikhail Blokh and Lise Hart. A preview of the film’s debut on home entertainment formats is hosted here. The film’s story is complex. Grafton Torn is a horror film writer. An accident has left him with amnesia. But when his memories begin to return, he is terrified by what he sees. With help from his long-time friend, Deter, he embarks on a journey of rememberance. What he finds will leave viewers in shock. SGL Entertainment will distribute the film with several extras. The film’s release will host behind-the-scenes featurettes, bloopers, outtakes and trailers. Fans of indie horror are encouraged to see the film for themselves as the film has been described as “a thinking man’s psychological horror film,” by Michael Juvinall of Horror Society. Very complex and full of twists, Deadly Revisions is one of the most exciting film releases of the year! *the film will be available on Sept. 29th in the following formats and on these platforms: Blu-ray, DVD, Comcast Cable TV, VOD, iTunes, Amazon Prime and Google Play.